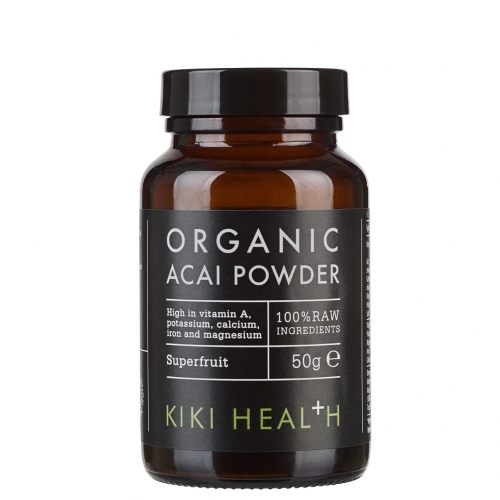 Kiki Health Acai Powder is made from pure organic , raw acai berries from the Amazon rainforest which have been freeze-dried to retain the vital nutrients and ­flavour of the fresh fruit. Our Acai Powder is made from pure organic , raw acai berries from the Amazon rainforest which have been freeze-dried to retain the vital nutrients and ­flavour of the fresh fruit. The acai berry grows on clusters of branches on a palm tree which has a long thin trunk up to 25m high, the clusters hang like ribbon-like leaves. Traditionally the tribe’s men would shimmy up the tree and cut by hand the branches from the top of the palm tree. The tribes of the Amazon Rain Forest first used the berry to help various aliments due to its tremendous health properties. These power packed little fruits are high in vitamin A, potassium, magnesium, calcium and iron.